Wine and chocolate have always been a part of many memorable romantic moments. It is the emotion of happiness, pleasure and joy of sharing that a good wine or chocolate evokes that complements the feeling of love. 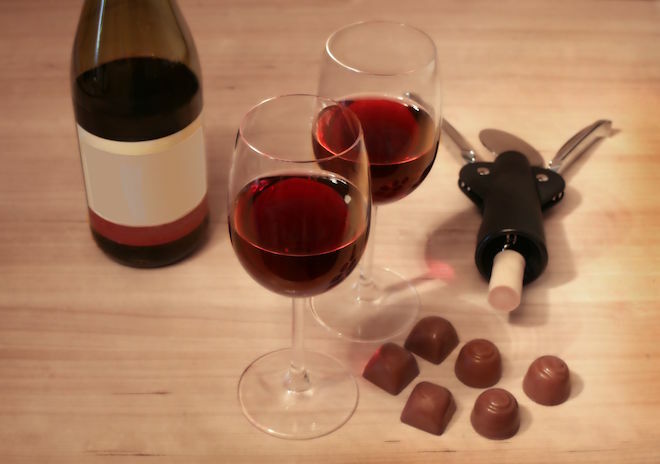 Pairing wine and chocolate, just like romance, has its own chemistry; more often it is a difficult endeavor to pair them both together, and just as love demands an understanding of each other, so does the pairing of wine and chocolate. Good and beautiful things exist on their own but it needs a certain chemistry to find harmony with others. Without chemistry there is no romance and the same can be said when it comes to pairing wine and chocolate. Both wine and chocolate come in a range of flavors, style and weights and therefore understanding these characteristics is important to have the right chemistry for pairing. 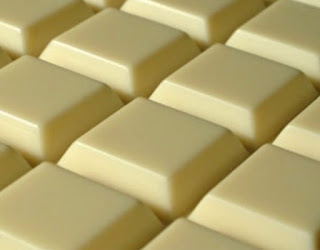 White chocolate is made with a blend of cocoa butter, milk solids, milk fat, sugar, vanilla and a fatty substance called lecithin that holds it all together. The guideline for wine and white chocolate pairing is to seek complementary flavors. The sweetness of white chocolates pairs best with wines that are sweeter and have matching flavor intensities. It is important that the chocolate does not overpower the wine or the wine hide the flavor of the chocolate. Hence the wine must be sweeter than the chocolate, which means selecting a wine that is higher in sugar than the chocolate or has more fruit notes. 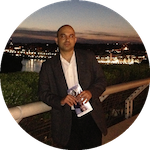 The flavor intensities must also match; A richly flavored chocolate needs a similarly rich wine, while a chocolate light in flavor needs a light wine. Additionally if the chocolate contains additional flavor components like nuts or fruits, a wine having similar flavor notes would pair well with it. Some of the wines that pair well with white chocolate are Brachetto d'Acqui, Ice Wine, Muscat, Moscato d'Asti, Sweet Tokaji and Creamy Sherry. Brachetto d'Acqui is a frizzante (light sparkling) red wine that originates from the Piedmont region of northern Italy. It has a light body, with a trace of sweetness and fruit notes of strawberries, cherries and raspberries. It pairs well with white chocolates that are light in flavor or white chocolates with dried fruit. Ice Wine is a dessert wine made in cold climates from grapes left to freeze on the vines, resulting in an intensely sweet wine with strong fruit flavors. It pairs well with white chocolates that are creamy and have milk fat. Muscat includes a family of grapes and the two best-known clones are Muscat Blanc and Muscat of Alexandria which creates wines of intense sweetness. It pairs well with white chocolates that have a creamy, buttery flavor or with soft white chocolate chip cookies with macadamia nuts. Moscato d'Asti is a semi-sweet, lightly sparkling wine from the Piedmont region of northern Italy. Moscato is the Italian name for the Muscat Blanc grape variety. This sweet sparkling wine will pick up the creaminess of the white chocolate. Tokaji or Tokay is the name of the wines from the Tokaj wine region in Hungary or the adjoining Tokaj wine region in Slovakia. Tokaji Aszú is the famous sweet wine made with botrytised ('nobly' rotten) grapes. The sweetness of these wines is measured in puttonyos and a level of 5 or 6 is needed for chocolate paring. These wines have good acidity and rich honeyed apricot, and orange peel flavors. It pairs well with white chocolates with dried fruit and nuts. Sherry is a fortified wine made from white grapes that are grown near the town of Jerez de la Frontera in Andalusia, Spain. Cream Sherry is a type of sweet sherry made by blending different sherries, usually including Oloroso and sweetened by the addition of Moscatel or Pedro Ximénez. These wines have smooth, creamy, nutty flavors and finish and pair well with the creamy texture of the white chocolate. The main ingredients in dark chocolate are cocoa powder, cocoa butter, chocolate liquor and a sweetener such as sugar from sugar cane or sugar beets and an emulsifier such as lecithin. Optional ingredients are milkfat, vanilla, fruit or nuts. The presence of cocoa and lack of milk additives gives dark chocolate a dry tannic texture and bittersweet aftertaste. The successful pairing of wine and dark chocolate needs a good understanding of complementary attributes like the dry and tannic texture and individual characteristics such as the sweetness in the chocolate and fruit flavors in the wine. When pairing dark chocolate and red wine, which both have tannins, it is important to match the strength of their tannin structure, so they cancel themselves, hence bringing out the fruit flavors present in the wine. Since cocoa adds a tannic texture to the chocolate, higher percentage of cocoa, requires a wine with higher tannins. Some of the wines that pair well with dark chocolate are Cabernet Sauvignon, Zinfandel, Syrah/Shiraz, Merlot and Port. The fruit flavors and tannins of Cabernet Sauvignon can vary based on its region and style of production. Cabernet Sauvignon has flavors of black currant, plums and blackberry, which are accentuated when pairing with dark chocolate. Zinfandel a grape variety popular in California, has fruit flavors of cherry and blackberry which are accentuated when pairing with dark chocolate. Syrah/Shiraz has fruit flavors of blackberry and plum and additionally notes of chocolate and mocha depending on how the wine is aged. Due to the chocolate and mocha flavors in the Shiraz, Shiraz also goes well with mocha or coffee flavored dark chocolates. Merlot low in tannins with fruit flavors of plums and black cherry pairs well with dark chocolates that have around 50 - 55% cocoa. The softness of the wine and the plum flavor is highlighted when pairing with dark chocolates. Port is a fortified wine from the Douro Valley, Portugal. Depending on the length of aging the style of Port can be classified as Ruby or Tawny. Ruby Ports are aged for a shorter period as compared to Tawny Ports, and therefore have strong fruit flavors of raspberry, cherry and cranberry with medium tannins and goes well with dark chocolates that has around 60 - 65% cocoa. Creativity, experimentation and individual palate can make this wine pairing interesting by trying dark chocolates with a fruit filling or caramel and sea salt. The main ingredients in a milk chocolate are milk powder, cocoa powder, cocoa butter, sugar and an emulsifier such as lecithin. Optional ingredients are peanuts, hazelnuts, almonds or other nuts. 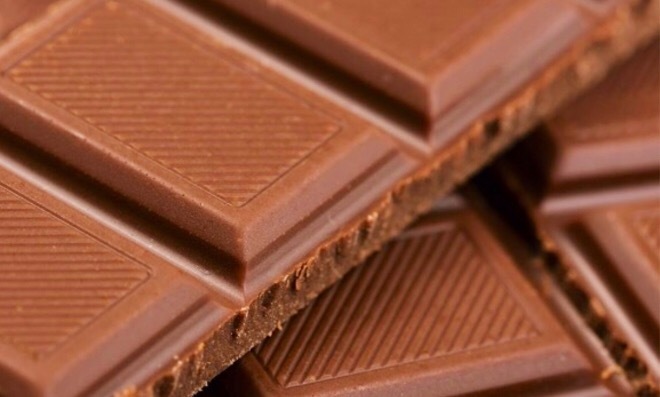 With the addition of cream and sugar and lower percentage of cocoa, milk chocolate is a versatile pairing with wine. The guideline for wine and milk chocolate pairing is to seek harmony between the ingredients in the chocolate and the characteristics of the wine. 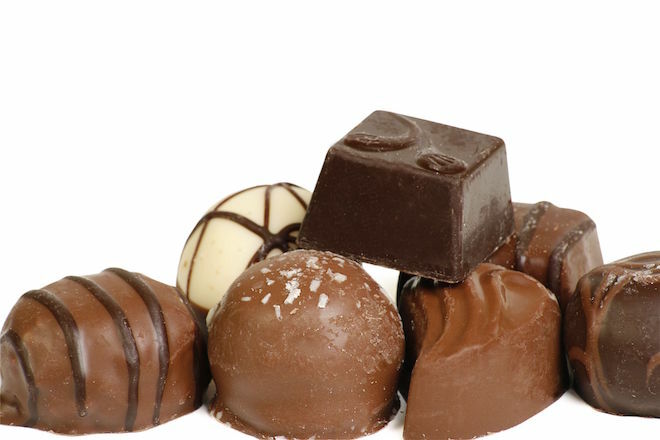 Some of the wines that pair well with milk chocolate are Pinot Noir, Merlot, Ruby Port, Muscat, Vino Santo and Champagne. Pinot Noir has very low tannins and fruit flavors of cranberry, cherry and raspberry depending on the climate of the wine growing region. The milk chocolate must have very little sugar so the fruit flavors in Pinot Noir stand out. Merlot also does well with the milk chocolate because of its fruit flavors and low tannins. A Ruby Port with good fruit flavors and low tannins is a great pairing with milk chocolate. Milk chocolate with a creamy, buttery flavor pair well with Muscat. Vino Santo is a sweet dessert wine made in Italy predominately in Tuscany. The wine has flavors of caramel, hazelnut, hint of honey and dried apricot. It makes a great pairing with the creamy textures of the milk chocolate or chocolates with nut-fillings such as hazelnut. Champagne paired with strawberries dipped in white chocolate is a great pairing for adding a special romantic touch or celebrating a special moment. The lively acidity of the Champagne and its berry flavors combine beautiful with the flavorful strawberries against the backdrop of the creamy milk chocolate texture. Chemistry plays an important role in romance and also in wine and chocolate pairing. Wine and chocolate each have their own strong characteristic, range of style and flavors, so it is important to find the right harmony to create a great pairing that accentuates their wonderful qualities.